We are a leading Exporter of cotton friction fr, double sided cotton tape, double sided printing tape, double sided stereo tape in daman, double sided mounting tape and double sided block tape, daman from Delhi, India. Cotton Friction Tape is a type of adhesive tape made from cloth impregnated with a rubber-based adhesive. 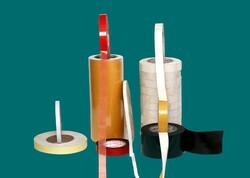 this tape is mainly used to increase grip or friction. Because the adhesive is impregnated in the cloth. the frictional properties of the tape come from the cloth material which is often made from cotton.